This section begins at the Bridge of the Gods (elev. 180′), on the Columbia River and ends at Monument 78 on the Canadian border (elev. 4,240′). An additional seven miles were added beyond the border by the Canadian government to provide access to Highway 3 in British Columbia’s Manning Provincial Park (elev. 3,800′). Starting with a lengthy climb out of the Columbia River Gorge, the trail eventually reaches the crest near the Indian Heaven Wilderness, a lake-filled land abounding with huckleberries. Next, it rounds the base of mammoth Mount Adams (elev. 12,276′). Just north lies the dramatically rugged Goat Rocks Wilderness and a traverse of the Packwood Glacier. The trail crosses Highway 12 at White Pass before encountering dozens of lakes in the William O. Douglas Wilderness. Between White Pass and Highway 410 at Chinook Pass, the trail skirts many lakes as it approaches the towering monarch of the Cascades, Mount Rainier (elev. 14,410′). From Chinook Pass, the trail has an easy, rapid run to Interstate 90 at Snoqualmie Pass. This stretch presents many private land clearcuts that offer little cover from the often present rain. The North Cascades offer many challenges. Here, the PCT climbs up a deep canyon to a high mountain pass, only to descend another deep canyon and repeat the cycle. The trail traverses popular Alpine Lakes, Henry M. Jackson and Glacier Peak Wildernesses before entering the Lake Chelan National Recreation Area, North Cascades National Park and Pasayten Wilderness. 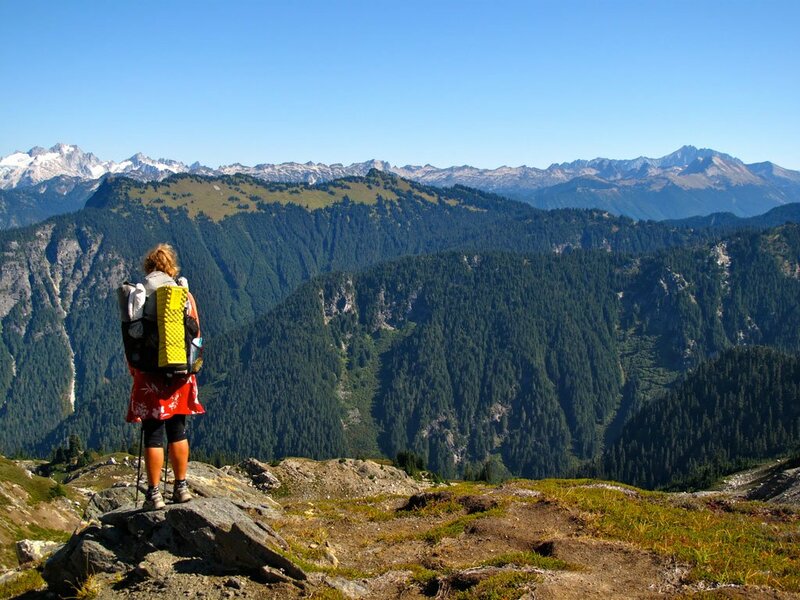 The prime attraction is Glacier Peak, and the rugged route around it offers a memorable experience to trail users. Not only is the North Cascades Range rugged, it is the wettest along the route, lying in a storm track most of the year. This precipitation has produced about 750 perennial snowfields and small glaciers, which collectively account for about half the snowfield area in the lower 48 states. The Washington section of the trail has several high passes and ridges. Lakeview Ridge (elev. 7,126′) is the highest and is located only eight miles before the Canadian border. A number of Alaskan and Canadian plants, including Alaska cedar and grand fir, are found in Washington. When visiting this section in September, visitors will be treated to brightly colored patches of western larch, whose deciduous needles turn bright yellow providing a colorful conclusion to the end of a thru-hike. The following agencies manage the land that the PCT crosses in the region. Their websites and phone lines are a wealth of information.